The Baba Yaga (called Baba Jaga in Poland, Baba Roga in Bosnia, Baba Pehtra in Slovenia, and Ježibaba in the Czech/Slovak lands) is a forest-dwelling witch of Eastern European folklore. She is, in many ways, the archetype of the woodland witch, and traits such as the eating of wayward children and flying with brooms may be attributed to legends of the Baba Yaga. In the Skazki (fairy tales) of Russia, she sometimes appears as a trio of “sister” Baba Yagas, much like the Greek Hecatae or gorgons (though when appearing as a trio, these Baba Yagas are usually less sinister, and often helpful). She is described as having a big nose, iron teeth, tangled hair, bony legs and a long reach. The Baba Yaga is very clever and powerful, having control over the elements and the “three riders”—the white horseman of the dawn, the red horseman of the sunrise, and the black horseman of nightfall. In the oldest Baba Yaga stories, her powers resemble those of a goddess more than a witch, and she and her hut act as guardians/gateways to the underworld. 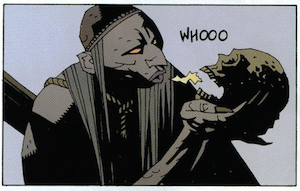 The Baba Yaga generally kills people in order to eat them. Her house is fenced about with the bones of the men whose flesh she has devoured; in one story she offers a human arm, by way of a meal, to a girl who visits her. —W. Ralston, 1887. 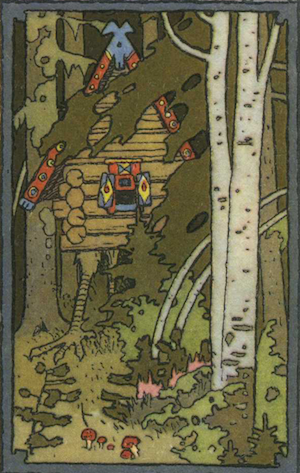 The Baba Yaga lives deep within a birch forest in a hut that stands on giant chicken legs. (In Polish stories the hut has just one leg.) It can turn and move around the forest, creaking and screeching as it does so. Baba Yaga is able to fly, usually low to the ground, using a mortar as a vessel and its pestle as a rudder. Another implement the Baba Yaga travels with is her broom, which she uses to brush away all physical signs of her passing—though fell and monstrous sounds and events will often occur in her wake. She also has mysterious household assistants—three disembodied pairs of hands that come to her and perform tasks when needed. 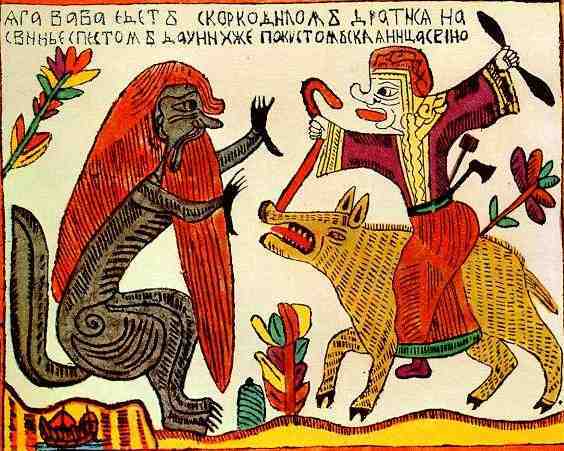 An early 17th-century lubok of a confrontation between Baba Yaga (riding a pig) and the infernal Crocodile of the underworld. Although visitors sometimes come to her for help or guidance, she is at least as likely to eat them as offer aid. In one skazka she is able to trick people into petrifying themselves—she does so by pulling a hair from her head, giving it to the victims, and instructing them to tie three knots in the hair and then blow. When they do so they turn to stone, at which point she puts them in her giant mortar and grinds them into dust. Kindness and purity of heart, or being “blessed,” and giving her due respect may protect the Baba Yaga’s visitors from harm. If you do find yourself about to be cooked for breakfast by the Baba Yaga, contorting your body so as to not fit neatly onto her spatula before being popped into the oven may also work. Modest Mussorgsky’s 1874 Pictures at an Exhibition‘s ninth movement is called “The Hut on Fowl’s Legs,” and is inspired by a painting of the Baba Yaga’s hut. Additionally, Emerson Lake & Palmer’s live 1972 album, also called Pictures at an Exhibition and based on the Mussorgsky piece, contains two songs about the Baba Yaga: “The Hut of Baba Yaga” and “The Curse of Baba Yaga.” The prolific Russian composer Anatoly Lyadov also wrote a symphonic work about her: Baba Yaga for orchestra, Op. 56 (1891–1904). 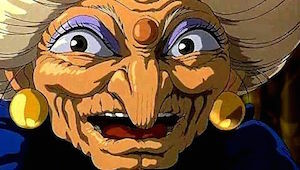 In the 2001 Hayao Miyazaki film Spirited Away, the witch spa-keeper Yubaba is likely based on legends of the Baba Yaga. She keeps her workers in servitude to her by stealing their true names. Like Baba Yaga, however, Yubaba is not always malevolent, and can occasionally be kind when it suits her to do so. Baba Yaga is a character in the Dark Horse comic Hellboy, first appearing in the 1996 mini-series “Wake the Devil.” In Hellboy, she is in league with fellow Russian fairy tale characters Koshchei the Deathless, Vasilisa the Beautiful, and the great Slavic thunder god Perun as well as the real historical figure Grigori Rasputin. 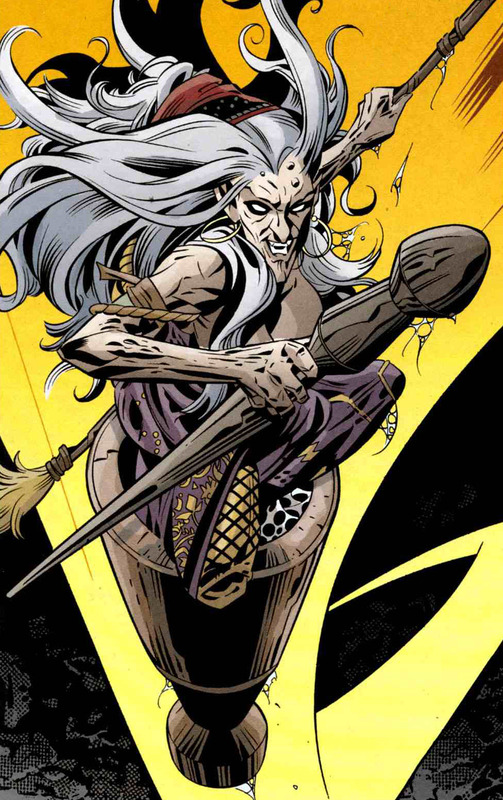 The Baba Yaga also appears in at least two Vertigo comic book series: she is featured in the Sandman issue “The Hunt,” and has been a recurring character in Fables. She can be found in the Marvel comic book universe as well. Baba Yaga in her flying mortar. Sandman #38, “The Hunt,” by Gaiman/Eagleson/Locke, 1992. Books, films, and other works too numerous to mention have been created based on legends of the Baba Yaga. She is an ancient, wise and fascinating creature—although we hope that were we to come across her chicken-legged hut in the woods someday, we would have the good sense to walk on. Johns, Andreas. Baba Yaga: The Ambiguous Mother and Witch of the Russian Folktale. 2004. Goscilo, Skoro, Zipes & Forrester. Baba Yaga: The Wild Witch of the East in Russian Fairy Tales. 2013. Barlow, Toby. Babayaga: A Novel of Witches in Paris. 2014. Ugresic, Dubravka. Baba Yaga Laid an Egg. 2011.